Once upon a time, I promised I was going to write an article about how emotions affect our decision-making and why it is actually important not to ignore the feelings we have in certain situations…For several, unexplainable reasons I kept postponing this idea, and for that I am very sorry. Having said that, there is no better way of making up for this than to finally keep my promise. So, here we go! In order to achieve a better understanding of what the process of forming emotions involves, scientists talk about emotional experience and emotional expression. The latter refers to body manifestations and behaviours in response to certain stimuli, for example changes in facial expression, heart rate, sweating, skin conductance etc. It has been a subject of debate for several decades whether emotional experience or emotional response is the one responsable for formation of the other, or that they act independently. It is now believed that different emotions depend on specific parts of the brain and are determined by different neural circuits. But why should we care about emotions in the first place? Some of you might find it strange, but emotions are intensely interconnected with reasoning and decision-making. And no, I don’t mean that they impair the process of making the right decision, it’s actually quite the opposite: most of the times we need emotions in order to be able to do what is best for us in a certain situation. A man who has gone down in history for surviving a terrible accident at the work place, but maybe mostly because of his importance in understanding the role of emotions in decision-making, is a late 19th century foreman, Phineas Gage. He had been hired as a foreman on a railroad construction site in Vermont and one of his tasks was to sprinkle explosive powder into blasting holes. This sounds like a dangerous thing to do, but Gage was regarded as one of the best people in this field: he was said to be very efficient, energetic, balance-minded, tenacious, a smart and successful business man etc. One moment of carelessness dramatically changed his life forever, and at the same time had a huge impact on the way scientists began to think of emotions. The powder exploded and a tamping iron entered Gage’s head under his left eye, passing through his left frontal lobe, and exited the skull, leaving a hole which measured more than 9 cm in diameter. Gage survived, but he “was no longer Gage”, as his friends and acquaintances used to say. Apart from losing vision in his left eye, the man had no motor or sensory deficits, he could hear, touch, sense, walk and talk. It was his personality that was completely changed. He became capricious, irreverent, impatient, and behaved as if he did could not predict, nor care about any professional or personal failure. He was soon fired and found different jobs over time, most of which were related to the accident and the iron rod, which had turned him into some sort of freak. The limbic system is probably the first to come to mind if you refer to brain areas involved in emotions. It consists of structures around the thalamus or in the temporal lobe, such as the amygdala, the hypothalamus, the limbic cortex, the cingulate gyrus, the fornix, the corpus callosum etc. Each one of these structures is involved in specific types of emotion and in triggering certain behaviours or responses through the autonomic nervous system. For example, the amygdala is linked to fear and aggression. Different regions (nuclei) in the amygdala are associated certain functions, so that both emotional expression and experience require the amygdala in order to be formed. Projections from amygdala are sent to the hypothalamus, which determines the autonomic response, the brain stem for behavioural reaction and the cerebral cortex, which is involved in emotional experience. The amygdala is also thought to play a role in enhanced emotional memory. Regulation of specific emotional behaviours depending on the limbic system is facilitated by one of the major neurotransmitters, serotonin. Neurons containing serotonin originate in the brain stem (in the raphe nuclei) and send projections to the hypothalamus. Serotonin is associated with a decrease in aggressive behaviour, but at the same time is involved in dominance, as proven by studies in rhesus monkeys. The Papez Circuit (named after the neurologist James Papez who came up with the idea of an “emotional system”) is composed of interconnected anatomical structures (many of which are part of the limbic system) that link emotional expression and emotional experience together. Papez proposed that the cingulate cortex determines emotional experience, while the major structure involved in emotional expression is the hypothalamus. Below I have inserted a diagram showing the Papez Circuit, based on information from Bear et al. 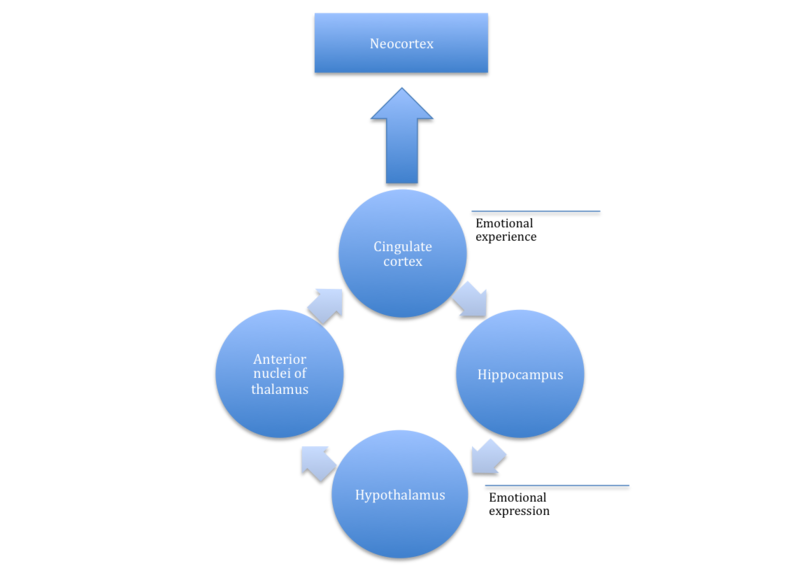 Note that the hippocampus is now thought to have less importance in the process of emotion formation. The discussion above does not fully explain what happened in the case of Phineas Gage. There is much more to emotion than that! Given the fact that the iron rod severely affected Gage’s frontal lobe, we should definitely focus our attention on this structure, too. The frontal lobe and the prefrontal cortices are involved in planning, reasoning, social behaviour, motivation, defining our personalities etc. Damage to these regions, especially to the ventromedial prefrontal cortices, results in decision-making impairment. While the intelligence and the other body functions remain intact, the patient who has suffered the damage is no longer able to exhibit normal social behaviour. The patient becomes emotionless and this lack of emotions and self motivation makes them incapable of making the right decisions. If instead of the ventromedial prefrrontal cortices, another region of the prefrontal cortices is affected, there is a very strong possibility that the patient’s intellectual abilities are compromised, along with their ability to form emotions. This region is called the dorsolateral prefrontal cortices. The person with a damage in this brain area would encounter severe difficulties when it comes to operations on numbers, words, space etc. Another brain structure involved in the process of emotion forming is located in the right hemisphere. If the somatosensory cortices of this area are injured, the result would be similar to what can be seen in the case of a damaged ventral prefrontal cortex, but there is something more…the processes of basic body signaling are also disrupted. This can be observed in patients suffering from anosognosia, a disease in which the patient is unaware and denies their disability. I have tried to comprise a lot of information and simplify things as much as possible. If you managed to get here with both eyes open, I couldn’t be happier. Hopefully, you can see now why we should also “think with our hearts” when we need to decide about a certain situation…because the “heart” is somewhere in the brain and it knows better than us what we need to do.